The heart of Tuscany is Chianti, one of the most picturesque wedding places in Italy. No one visiting la Tuscany should miss driving through its rolling hills and vineyards. The landscapes delight the eye and the wines and local foods will certainly delight your palate! The tiny Chianti region lies in the provinces of Florence and Siena, which are equally famous for their medieval hill towns, countryside and places for weddings. Marrying in Chianti means having the best selection of places for wedding halls and churches for your ceremony and the finest castles and villas in Italy. Indeed, the choices for wedding venues here is a bit staggering and it may take some time to work through the many options available. Our wedding planners are experts in helping couples find the perfect place. Most of the places for wedding halls are Medieval or Renaissance palaces set in the middle of charming squares in the heart of tiny towns. Romantic country churches are immersed in the Chianti landscapes and surrounded by miles of vineyards. Imposing cathedrals are available in Siena and Florence. 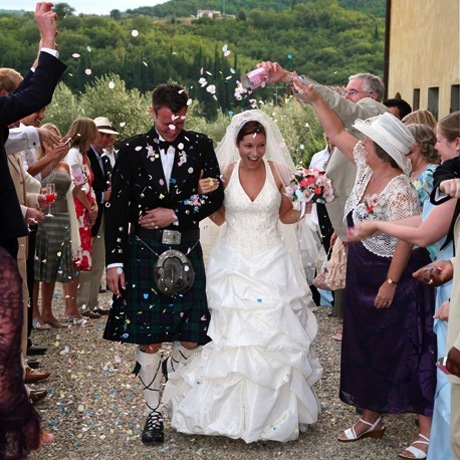 Your wedding reception in Chianti will allow you to take advantage of the incredible local wines and foods; served in abundance in keeping with the warm hospitality of the Tuscans. Imagine a medieval castle with turrets lit up at night by candles and torches with the finest crystal and damask tablecloths and medieval musicians to greet your guests! All this is possible in a place called Chianti.